Int J. MorphoL, 25(2):439-444, 2007. * Laboratorio de Biología Molecular y Farmacogenética, Depto. de Ciencias Básicas, Facultad de Medicina, Universidad de La Frontera, Temuco, Chile. ** Departamento de Ciencias Preclínicas, Facultad de Medicina, Universidad de La Frontera, Temuco, Chile. *** Departamento de Medicina Interna, Facultad de Medicina, Universidad de La Frontera, Temuco, Chile. **** Alumnos Programa Doctorado en Ciencias c/m Biología Celular y Molecular Aplicada, Universidad de La Frontera, Temuco, Chile. SUMMARY: The platelet endothelial cell adhesion molecule-1 (PECAM-1), a 130-kDa membrane glycoprotein, is expressed on the surface of monocytes, some T-lymphocyte subsets, neutrophils, platelets and endothelial cells. PECAM-1 plays a key role in the transendothelial migration of circulating leukocytes during vascular inflammation. The aim of the present investigation was to evaluate the association between the C373G polymorphism of the PECAM-1 gene and coronary artery disease in Chilean subjects. A total of 220 individuals were investigated (112 cases and 108 controls). The presence of coronary artery disease was confirmed by angiography (Stenosis >70%). The C373G polymorphism was detected by polymerase chain reaction followed enzymatic restriction. The genotype frequencies were in agreement with those predicted by the Hardy-Weinberg equilibrium in both groups. The genotype distribution and the relative alíele frequencies for C373G polymorphism of the PECAM-1 gene were similar between cases and controls (P= 0.820 and P= 0.739, respectively). Moreover, the OR associated with the mutated G alíele was 0.92 (C.I. 95%, 0.54 - 1.57; P=NS). In summary, our study showed that C373G polymorphism of the PECAM-1 gene is not associated with coronary artery disease in the population analyzed. RESUMEN: La molécula de adhesión celular endotelial plaquetaria-1 (PECAM-1) es una glicoproteína de membrana expresada por células endoteliales, plaquetas, monocitos, neutro filos y algunos tipos de linfocitos T. Constituye una pieza clave en la extravasación de leucocitos a través de las uniones intercelulares del endotelio vascular durante el proceso inflamatorio. El objetivo de nuestro estudio fue determinar la asociación entre el polimorfismo C373G (Leul25 Val) del gen PECAM-1 y enfermedad coronaria, en individuos chilenos. Se estudió un total de 220 individuos (112 casos y 108 controles). La presencia de enfermedad coronaria fue confirmada mediante angiografía (estenosis > 70%). El polimorfismo C373G, fue detectado mediante la técnica de reacción en cadena de polimerasa seguida de restricción enzimática. Las frecuencias genotípicas observadas en ambos grupos cumplen con la ley de Hardy-Weinberg. La distribución de genotipos como la frecuencia relativa de alelos para el polimorfismo C373G del gen PECAM-1, fueron similares entre casos y controles (p = 0.820 y p = 0.739, respectivamente). Además, la OR asociada al alelo mutado G fue 0.92 (I.C. 95%, 0.54-1.57; p= NS). Los datos obtenidos sugieren que el polimorfismo C373G del gen PECAM-1 no está asociado a enfermedad coronaria en la población analizada. PALABRAS CLAVE: Aterosclerosis; PECAM-1; Polimorfismo. Actually, the atherosclerosis is considered an inflammatory disease (Libby, 2002; Meng, 2006), due to that the inflammation participates centrally in all stages of this disease, from the initial lesion to the end-stage thrombotic complications (Libby, 2006). One of the characteristics of the inflammation is the leukocyte recruitment to the damaged tissue, in this case the vascular endothelium (Price & Loscalzo, 1999; Libby, 2002). The recruitment of these inflammatory cells and their transendothelial migration is mediated by the cellular adhesion molecules (CAMs), which are expressed by endothelial cells and circulating leukocytes (monocytes and linfocytes) in response to different inflammatory stimuli (Davies et al. 1993). Three families of CAMs participate in the leukocyte-endothelium interaction: a) the selectines that facilitate rolling of leukocytes over the endothelial surface; b) the integrines, basically for the adherence of the leukocytes to the endothelium and c) the superfamily of immunoglobulines that have importance in the adhesion and transmigration of the leukocytes (Davies et al. ; Mullere? al, 1993;Albelda et al.1994; Blankenberg et al. , 2003). PECAM-1 is a 130-kDa membrane glycoprotein and a member of immunoglobulin (Ig) superfamily; their gene is located in the long arm of the chromosome 17 (17q23) (Gumina et al. 1996). PECAM-1 is constituted by 6 Ig-like (homology) extracellular domains, a short transmembrane domain and a citoplasmatic tail of 118 aminoacids, is expressed on the surface of platelets, monocytes, neutrophils and some types of T lymphocytes (Newman et al. 1990; Newman, 1997). It is an important constituent in the intercellular unions between the endothelial cells and a key element in the transendothelial migration of leukocytes during the inflammatory process (Albelda et al. 1991; Mullere?al). Considering the role of PEC AM-1 in the development of atherosclerosis and other diseases such as cancer, HIV infection and multiple sclerosis (Bergom et al. 2005; Maas et al. 2005; Eugenin et al. 2006; Nelissen et al. 2006), there are a great interest to study its normal function, its genetic variations and its relation with these diseases. Several polymorphisms have been identified in the PECAM-1 gene: C373G (Leul25Val, exon 3), G1688A (Ser563Asn, exon 8), A2212G (Arg670Gly, exon 12) and G53A (5'UTR region) (Behar et al. 1996; Wenzel et al. 1999; Gardemann et al. 2000; Sasaoka et al. 2001; Elrayess et al. 2003; Song et al. 2003; Elrayess et al. 2004; Listi etal., 2004; Wei et al., 2004; Fang etal., 2005). In particular, the C373G polymorphism of the PECAM-1 gene has been widely investigated, specially their association with coronary artery disease - CAD (Wenzel et al. ; Gardemann etal. ; Song et al. ; Wei et al. ; Fang et al. and acute myocardial infarction -AMI (Sasaoka et al. ; Listi et al.. However, there are no studies to date regarding the association of CAD with C373G polymorphism in American population, so we performed genotyping analyses of C373G polymorphism of PECAM-1 gene in Chilean patients with coronary artery disease and controls, and analyzed its association with the presence of CAD. Subjects. A total of 112 unrelated patients (83 men and 29 women), with diagnosis of coronary artery disease (CAD), defined as severe coronary artery stenosis by angiography (Stenosis >70%), admitted to the Cardiology Service of the Hernán Henríquez Hospital of Temuco City, Chile, were included in this study. The control group, included 108 unrelated individuals (59 men and 49 women) without history or clinical evidence of CAD at the moment of participated on this study. In both groups, there was no preselection of serum lipid levels. Demographic data and history of hypertension, diabetes mellitus, cigarette smoking, and hypercholes-terolemia were assessed in each subject during a personal interview. Subjects with a history of diabetes or basal glycemia >126mg/dl were defined as diabetic (American Diabetes Association, 2006). The study protocol was approved by the Ethics Committee of the University of La Frontera, and all subjects gave written informed consents. Biochemical determinations. Blood samples were obtained by venipuncture after overnight fast (>12h). Total Cholesterol and triglycerydes were determines by enzymatic-colorimetric assay(Fossatie?a/., 1982;Fossatie?a/., 1987). High-density lipoprotein cholesterol (HDL-C) concentrations were measured by enzymatic assay after phosphotungstic acid and magnesium precipitation of Low density lipoprotein cholesterol (LDL-C) and Very low density lipoprotein cholesterol VLDL-C (Burstein et al. 1970). LDL-C concentration was calculated using the Friedewald equation (Friedewald et al. 1972). Serum levels of glucose and uric acid were determined by enzymatic colorimetric methods (Barham et al. 1972; Fossati et al. 1980). Genotypification of C373G polymorphism of the PECAM-1 gene. Genomic DNA was extracted using a procedure described by Salazar et al. (2001). The C373G polymorphism of PECAM-1 gene was detected by polymerase chain reaction followed restriction fragments length polymorphism (PCR-RFLP). A 504-bp fragment was amplified using the following oligonucleotide primers: sense 5 '-CTA TC A GCC TGG CCC TGT AG-3' and antisense 5 '-TAT TCACGC CAC TGT GTG CT-3', previously described (Wei etal). The PCR conditions were: initial denaturation at 98°C for 3 min; the amplification was performed in 30 cycles consisting of 1 min at 94°C, 1 min at 60°C and 1 min at 72°C, and additionally a final extension of 10 min. 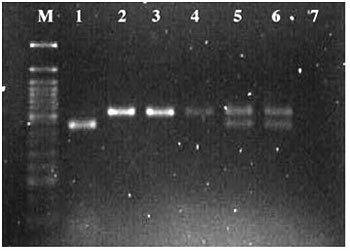 PCR products were evaluated on 1% agarose gel, stained with ethidium bromide (0.5 mg/dl) and visualized on a UV transilluminator. PCR products were digested with PvuII (Fermentas, Lithuania), in a total reaction volume of 20 ml. The enzymatic digestions were carried out at 37°C for 12 hours, and the restriction fragments were separated on 2% agarose gel and visualized on a UV transilluminator. The wild type genotype (CC) was identified by the presence of two fragments of 430 and 74 bp; mutated heterozygote genotype (CG) by three fragments of 504, 430 and 74 bp, and mutated homozygote genotype (GG) by a fragment of 504 bp (Fig. 1). Fig. 1. Agarose gel electrophoresis for the detection of C373G polymorphism of the PECAM-l gene. Genotype CC (lane 1), Genotype CG (lanes 5 and 6), Genotype GG (lanes 2, 3, 4). Lane M: 50-bp DNA marker and lane 7: reactive control. Quality control of biochemical and molecular determinations. The accuracy of biochemical determinations were evaluated by the use of normal and pathological commercial controls (Human, Germany). The possibility of contamination on molecular analysis was excluded by use of reactive controls on each amplification series. The correct assessment of genotype for C373G polymorphism at the PECAM-1 gene was confirmed by the randomly repetition of 10% of carry out analyses. Statistical analysis. Statistical analysis was done using the Sigma Stat Software, version 2.0 (Jandel Sci., San Rafael, CA, USA). Data are presented as mean ± SD. Differences between the means of the two continuous variables were evaluated by Student t-test. The allelic frequencies and genotype distribution were estimated by gene counting. Differences between noncontinuous variables, genotype distribution, alíele frequency, and Hardy-Weinberg equilibrium were tested by chi-square (x2) analysis. The Odds ratio (OR) for CAD and their 95% confidence interval (CI) associated with the G variant was also calculated. Statistical significance was at p < 0.05. Table I show the biodemographic characteristics of individuals enrolled in the study. The frequency of men and diabetes mellitus were higher in CAD group (p O.001). In relation to biochemical parameters, we observed that CAD patients presented a lower HDL-cholesterol levels (p <0.001) and higher glucose and uric acid concentrations (p <0.001). No significant differences were found between the groups for total cholesterol (p = 0.152), triglycerides (p=0.093) and LDL-cholesterol (p=0.868) concentrations. The genotype frequencies were in agreement with those predicted by the Hardy-Weinberg equilibrium (Table II). The genotype distribution and the relative alíele frequencies for C373G polymorphism of PECAM-1 gene were similar between cases and controls (p=0.820 and p=0.739, respectively). Moreover, the OR associated to the mutated G alíele was 0.92 (C.I. 95%, 0.54 - 1.57; p >0.05), confirming the absence of association. The multifactorial origin of cardiovascular diseases is widely documented (Mensah et al., 2005). 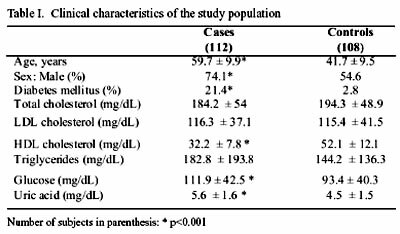 The contribution ofabnormal concentrations of lipids, glucose and uric acid in the development of coronary disease has been confirmed by several authors, although in the case of uric acid the degree of the contribution remains controversial (Austin et al. 1998; Bickel et al., 2002; Bauters et al. 2003; Tsouli et al., 2006). When we evaluated the laboratory parameters, was observed that the serum level of glucose and uric acid were higher in the subjects with CAD than controls. In addition, the HDL cholesterol concentrations were lower in this group. These results corroborate the association between these parameters and CAD. Contradictorily, the concentrations of total cholesterol, triglycerides and LDL cholesterol were similar in CAD patients and controls, probably due to use cholesterol-lowering therapy in CAD patients. In relation to C373G polymorphism of the PECAM-1 gene, we not found association between this genetic variant and the presence of CAD in Chilean subjects. The frequency of the mutated G alíele was similar between cases and controls (0.549 vs. 0.569, p=0.739). In addition, the OR associated to G alíele was not significant (OR= 0.9, CI 95%; 0.54 -1.57). On the other hand, Wenzel et al. (1999) suggest that C373G polymorphism is a risk factor for the development of coronary disease in German subjects. However, one year later in the same population, but with a mayor number of subjetcs, no evidence was found that permits indicate that the C373G polymorphism is an independent risk factor for CAD (Gardemann et al.). During the year 2003, another investigation realized in subjects from Finnish and German population demonstrates that C373G polymorphism was not associated with the degree of progression of atherosclerosis in patients submitted to coronary bypass surgery (Elrayess et al., 2003). On the other hand, in the same year, the C373G polymorphism was strongly associated with CAD in Chinese population (Song et al. 2003). Similarly, in the years 2004 and 2005, was demonstrated that the alíele G (Val) and the homozygous genotype GG (Val/Val) are significantly associated with CAD in subjects from Asia and India (Wei et al; Fang et al.). In addition, the possible association between C373G polymorphism of the PECAM-1 gene and AMI has been investigated, and in a similar way to observed with CAD, the findings of these studies are conflicting. In Italian population was not found association between this polymorphism and AMI (Listi et al.. However, in Japanese male a weak association was found, indicating that C373G polymorphism could not be the primary determinant of PECAM-1 association with AMI. This weak association may be in part explained by the linkage disequilibrium with others polymorphisms at the PECAM-1 gene, such as G1688A and/or A2212G which would have a genuine association with AMI. Furthermore, this investigation suggest that another possible explanation for the association of AMI with polymorphisms of PECAM-1 is the interaction with other genes localized near to PECAM-1 gene within the chromosome 17, an example of this is the angiotensin converting enzyme gene (Sasaoka et al.). These ambiguous results may be explained, in some measure, by interethnic differences. Is important to emphasize the mestizo character of Chilean population. The ethnical origin is represented principally by the native (Mapuche) and Spaniard population; furthermore other important ethnic groups (German, French, Italian and Swiss, among others) have been contributed to the genetic background of our population. Thus, is not absurd believe that the frequencies of alíeles for the investigated polymorphism and others, have unique characteristics that correspond to the mixture of races previously mentioned. Other important factor that may be related to the inconsistency in the results from genetic association studies is the sample size. Sample sizes of thousands are required to have adequate power to detect genes conferring ORs as low as 1.2, with minor alíele frequencies in the range of 5-10% (Hingorani, 2004). Finally, is important keep in mind that CAD have a multifactorial origin, thus the role of a single nucleotide polymorphism (SNP) can be influenced by the interaction with other genes, in addition to the modulatory effects of the environment. In summary, our data revealed that C373G polymorphism of PECAM-1 gene is not associated with coronary artery disease in the studied individuals. However, this result cannot be generalized because the heterogeneity of Chilean population. This study was supported by grants from Dirección de Investigación y Desarrollo, Universidad de La Frontera (DIDUFRO EP 120541 and PPF 140611).